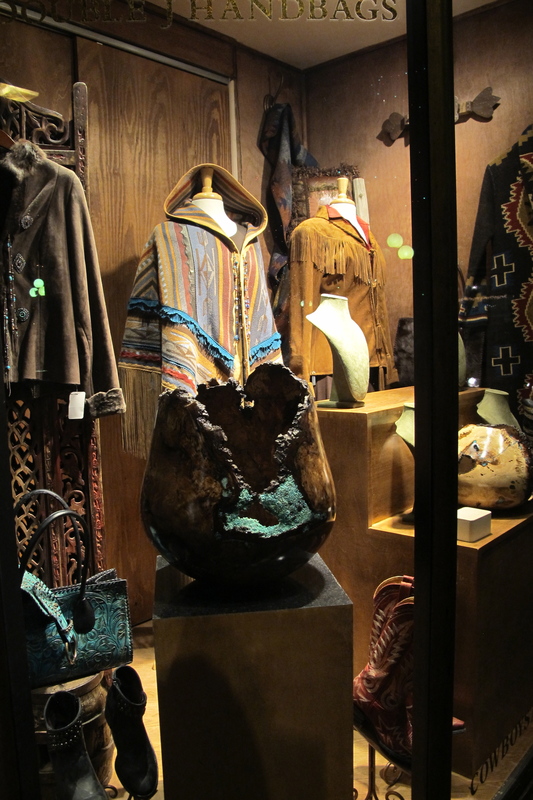 Been shopping in Santa Fe yet? This area has been an age old trading post and known for it’s shopping for centuries. Early New Mexico Puebloans traded their turquoise and other valuables for the precious metals and shells of the Mexican indians. Santa Fe soon became “the place” to exchange silver from Mexico. The Spanish later traded their domesticated animals, their yeast, and more. And then, the railroad made trading and shopping in Santa Fe a “must stop” for the curio shops of American Indian crafts. Santa Fe today is still a “must stop”! Visitors from all over the world come seeking the finest sterling silver & turquoise jewelry, pottery, and fine art of the Southwest. It is the 3rd largest art market in America! The Historic Downtown Plaza Square is surrounded by charming “Santa Fe Style” storefronts filled with treasures handmade and hard to find anywhere else. Whether you’re looking for fashion or furniture, fine or folk art, cowboy boots or concho belts, salsa or chiles, sterling silver or turquoise jewelry, you’ll find that and so much more in this shopper’s paradise of Southwest specialties as well as the wonders of authentic American Indian made items coming directly from the nineteen pueblos of New Mexico. It is a shopping experience that may become an addictive habit. Let’s go shopping in Santa Fe!